aka. "Crimea Conference" codenamed "Argonaut Conference"
World War II meeting of the heads of government of the United States, the United Kingdom, and the Soviet Union, represented by President Franklin D. Roosevelt, Prime Minister Winston Churchill, and General Secretary Joseph Stalin, respectively, for the purpose of discussing Europe's post-war reorganization. aka. "Berlin Conference of the Three Heads of Government of the USSR, USA and UK"
The three powers represented by Communist Party General Secretary Joseph Stalin, Prime Ministers Winston Churchill, and, later, Clement Attlee and President Harry S. Truman gathered to decide how to administer punishment to the defeated Nazi Germany, which had agreed to unconditional surrender nine weeks earlier, on 8 May (V-E Day). Hiroshima: uranium gun-type fission bomb "Little Boy"
Nagasaki: plutonium implosion-type fission bomb "Fat Man"
officially "The Sources of Soviet Conduct"
Written by George F. Kennan, Deputy Chief of Mission of the United States to the USSR. Published in Foreign Affairs magazine in July 1947. Winston Churchill's "Sinews of Peace" address at Westminster College used the term "iron curtain" in the context of Soviet-dominated Eastern Europe. officially "European Recovery Program (ERP)"
Gave $13 billion in US economic and technical assistance. Monetary support to help rebuild European economies after WWII to prevent spread of communism. officially the Warsaw Treaty Organization of Friendship, Cooperation, and Mutual Assistance. Mutual defense treaty between eight communist states of Central and Eastern Europe. Founded under initiative of the Soviet Union. 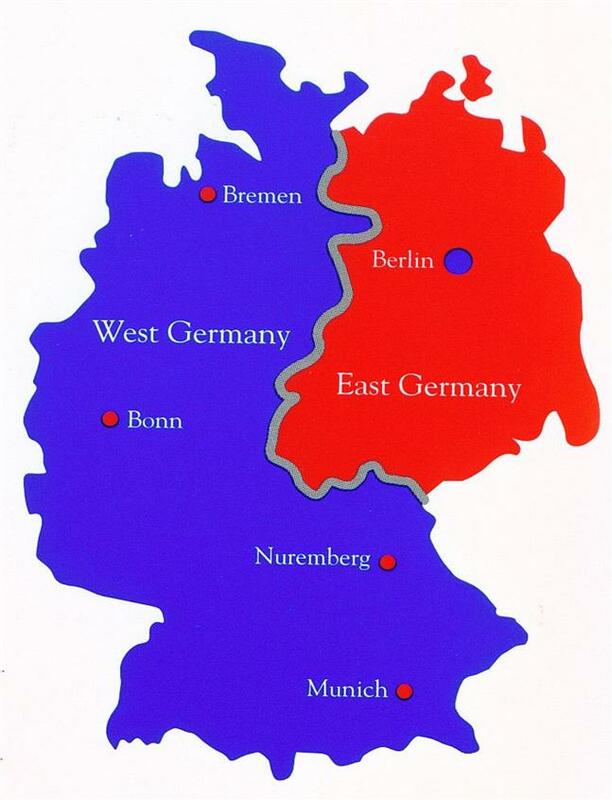 Soviet military reaction to the integration of West Germany into NATO in 1955.